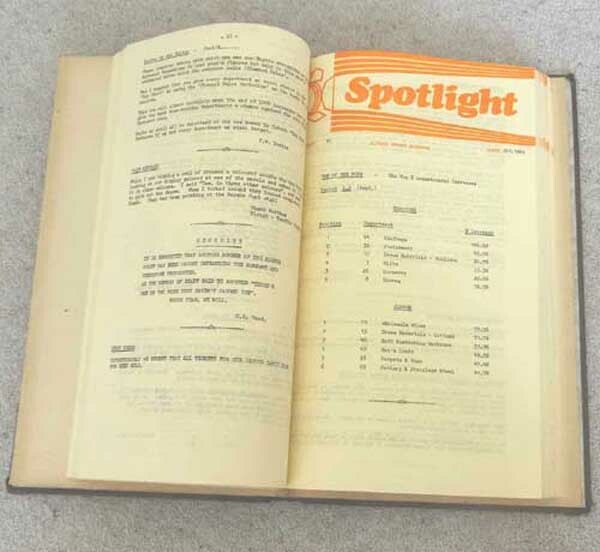 In the 1960s Suters introduced a house journal - Spotlight for members of staff past and present to contribute articles, jokes, recipes and the company could provide details of births, marriagges, deaths, news about company objectives, promotions, departmental figures, staff training courses and a great deal more. It is rather like looking at an extended family working with the Suters family and gives another insight into Suters Ltd in the late 1960s to early 1970s. This edition in the photo above covers the period till December 1974. Unfortunately no further issues of Spotlight have been discovered from 1975 to 1978. We have copied some of these pages and included them in this website at appropriate locations as PDFs and also listed them on this page. It was discovered in Robert Suter's archives in July 2018. You will see how formal contributors names are, with the first name hardly ever being used. As with many family businesses where several members of a family involved they were known as Mr David etc and the wives known as Mrs David etc. There were no pictures apart from cartoons as reproduction in that era was done on a "mimeo" type stencil duplicator / mimeograph machine. As this is quite a thick bound volume it was not easy to scan, so the only way was to take a photo of the appropriate section and convert to a PDF or attempt to scan it. Click on the links below to go to PDF many of the articles have been re-typed and are marked accordingly and usually the original incorporated into the PDF below them.